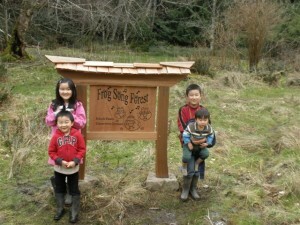 My latest project this winter has been building a sign for a wonderful land conservation covenant on Pender Island,BC. The Kikuchi’s, a local family here on Pender, have recently purchased a property with an amazing wetland full of biodiversity in order to protect it from any future development. This project was inspired by Arthur Kikuchi’s father who the land is dedicated to, and who spent his life in Japan helping protect the environment. The Kikuchi’s have placed a covenant on the land with help from the local Land Conservancy, Islands Trust, and the Nancy Waxler Morrison Foundation to make sure it stays as it is in perpetuity, for the people of Pender to enjoy. What an honour to be asked to help with building a sign to share this feeling and love of the land that the Kikuchi’s have. The Kikuchi’s are good friends and close neighbours, so knowing them already helped me in designing a sign that they would feel represents the land and connection with Arthur’s father. I suggested using the Japanese Torii Gate, as the main shape and design of the sign. The Torii Gate in Japan is a symbolic and physical entrance to a sacred space. With the help of Sanae Kikuchi I researched Japanese signs and Torii Gates, and came up with a design that would work with the reclaimed red cedar I would use to build the sign. It should be rustic and beautiful like the land, but have clean lines and clear graphics in contrast. I used rough sawn cedar boards(from reclaimed old growth wood), with live edge on the backside, but flat sawn on the front side for carving the lettering and graphics. 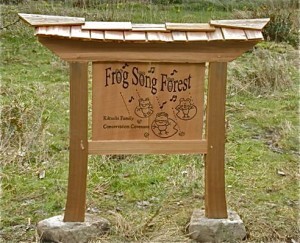 The sign posts and rails are all salvaged old growth red cedar split by hand, and picked for the wonderful natural taper and curve allowing for a wider base, showing its connection to the ground just like the trees around it. Like many Torii Gates, this sign has a simple hand split shake roof, helping protect the sign, and add to its design and style. The joints are all hand crafted mortise and tenon joinery with hardwood pegs. I decided to mount the sign on large rocks instead of using metal saddles set in concrete, which would have been more invasive in this situation, with the dampness of the wetland surrounding it. The most wonderful thing about the sign to me is the design of the lettering and graphics. 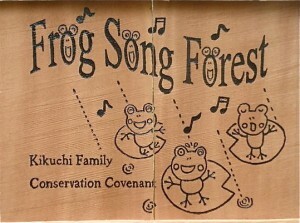 It was done by the Kikuchi’s two oldest children, Kenta and Yoko aged 10 and 8! What an amazing job! It so captures the spirit of fun and embodies the nature that is being preserved. 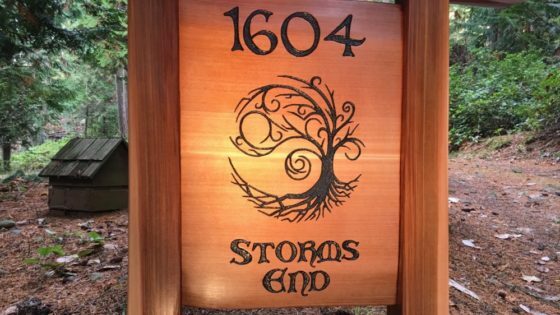 I used a projector to shoot this image onto the sign, traced it in place, and then carved the design into the rough cedar. Then I painted the sign with a high quality sign enamel. This should last for many years to come. I would like to thank the Kikuchi’s and Barrie Morrison (Nancy Waxler Morrison Foundation) for the opportunity to be involved in such a meaningful and important project on Pender Island.